Prominent Italian Talmudist; born about 1180. He originated in Trani (Conforte, "Ḳore ha-Dorot," p. 15a), an ancient settlement of Jewish scholarship, and lived probably in Venice. He died about 1250. He carried on a correspondence with Simḥah of Speyer and with Simḥah's two pupils, Isaac ben Moses of Vienna ("Or Zarua'," i. 88, 218, 220) and Abigdor Cohen of the same city. Isaiah himself probably lived for some time in the Orient. He left a learned son, David, and a daughter, with whose son, Isaiah ben Elijah di Trani, he has often been confounded. Isaiah was a very prolific writer. He wrote: "Nimmuḳim" or "Nimmuḳe Ḥomesh," a commentary on the Pentateuch, consisting mainly of glosses on Rashi which show him to have been, as Güdemann says, an acute critic rather than a dispassionate exegete. 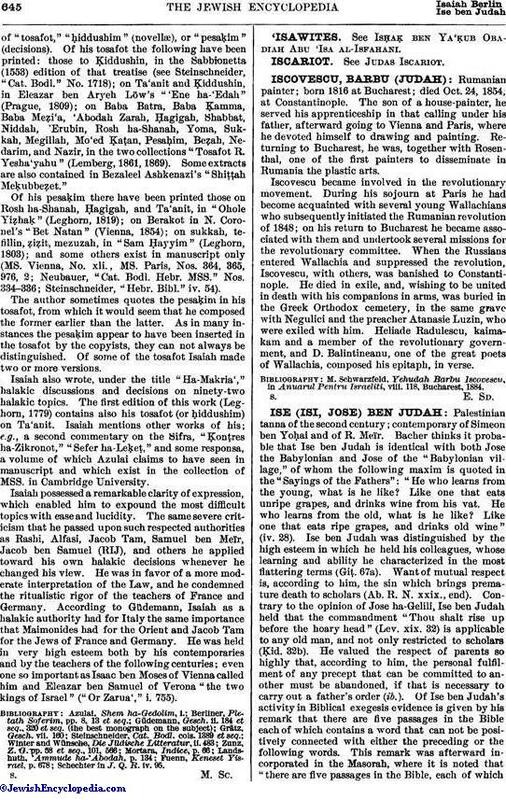 The work has been printed as an appendix to Azulai's "Pene Dawid" (Leghorn, 1792); extracts from it have been published in Stern's edition of the Pentateuch (Vienna, 1851) under the title "Peṭure Ẓiẓẓim" (see also Berliner, "Rashi," p. xii. ); and Zedekiah ben Abraham, author of "Shibbole ha-Leḳeṭ" and a pupil of Isaiah, composed glosses on it in 1297 (Leipsic MS. No. 15, p. 318). 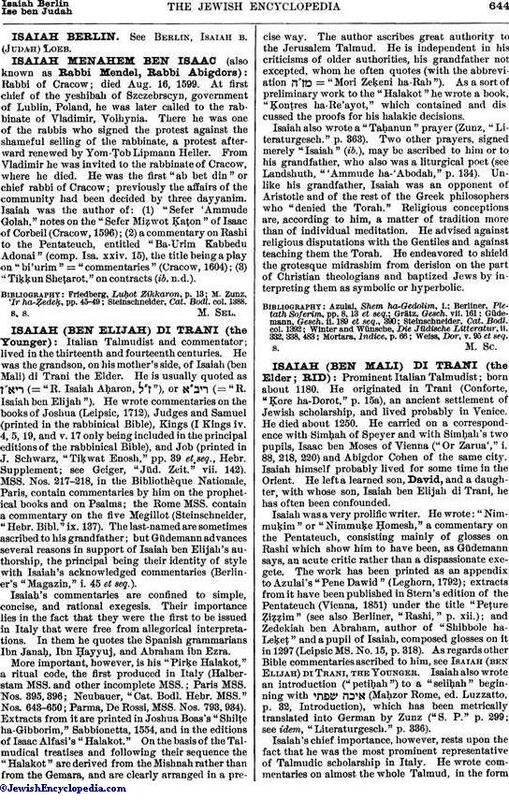 As regards other Bible commentaries ascribed to him, see Isaiah (ben Elijah) di Trani, the Younger. Isaiah also wrote an introduction ("petiṭah") to a "seliḥah" beginning with (Maḥzor Rome, ed. Luzzatto, p. 32, Introduction), which has been metrically translated into German by Zunz ("S. P." p. 299; see idem, "Literaturgesch." p. 336). Isaiah's chief importance, however, rests upon the fact that he was the most prominent representative of Talmudic scholarship in Italy. He wrote commentaries on almost the whole Talmud, in the formof "tosafot," "ḥiddushim" (novellæ), or "pesaḳim" (decisions). Of his tosafot the following have been printed: those to Ḳiddushin, in the Sabbionetta (1553) edition of that treatise (see Steinschneider, "Cat. Bodl." No. 1718); on Ta'anit and Ḳiddushin, in Eleazar ben Aryeh Löw's "'Ene ha-'Edah" (Prague, 1809); on Baba Batra, Baba Ḳamma, Baba Meẓi'a, 'Abodah Zarah, Ḥagigah, Shabbat, Niddah, 'Erubin, Rosh ha-Shanah, Yoma, Sukkah, Megillah, Mo'ed Ḳaṭan, Pesaḥim, Beẓah, Nedarim, and Nazir, in the two collections "Tosafot R. Yesha'yahu" (Lemberg, 1861, 1869). Some extracts are also contained in Bezaleel Ashkenazi's "Shiṭṭah Meḳubbeẓet." Of his pesaḳim there have been printed those on Rosh ha-Shanah, Ḥagigah, and Ta'anit, in "Ohole Yiẓhaḳ" (Leghorn, 1819); on Berakot in N. Coronel's "Bet Natan" (Vienna, 1854); on sukkah, tefillin, ẓiẓit, mezuzah, in "Sam Ḥayyim" (Leghorn, 1803); and some others exist in manuscript only (MS. Vienna, No. xli., MS. Paris, Nos. 364, 365, 976, 2; Neubauer, "Cat. Bodl. Hebr. MSS." Nos. 334-336; Steinschneider, "Hebr. Bibl." iv. 54). The author sometimes quotes the pesaḳim in his tosafot, from which it would seem that he composed the former earlier than the latter. As in many instances the pesaḳim appear to have been inserted in the tosafot by the copyists, they can not always be distinguished. Of some of the tosafot Isaiah made two or more versions. Isaiah also wrote, under the title "Ha-Makria'," halakic discussions and decisions on ninety-two halakic topics. The first edition of this work (Leghorn, 1779) contains also his tosafot (or ḥiddushim) on Ta'anit. Isaiah mentions other works of his; e.g., a second commentary on the Sifra, "Ḳonṭres ha-Zikronot," "Sefer ha-Leḳeṭ," and some responsa, a volume of which Azulai claims to have seen in manuscript and which exist in the collection of MSS. in Cambridge University. Isaiah possessed a remarkable clarity of expression, which enabled him to expound the most difficult topics with ease and lucidity. The same severe criticism that he passed upon such respected authorities as Rashi, Alfasi, Jacob Tam, Samuel ben Meïr, Jacob ben Samuel (RIJ), and others he applied toward his own halakic decisions whenever he changed his view. He was in favor of a more moderate interpretation of the Law, and he condemned the ritualistic rigor of the teachers of France and Germany. According to Güdemann, Isaiah as a halakic authority had for Italy the same importance that Maimonides had for the Orient and Jacob Tam for the Jews of France and Germany. He was held in very high esteem both by his contemporaries and by the teachers of the following centuries; even one so important as Isaac ben Moses of Vienna called him and Eleazar ben Samuel of Verona "the two kings of Israel" ("Or Zarua'," i. 755). Schechter in J. Q. R. iv. 95.